God has indeed blessed the KJV, for which we can all be very thankful. And I do not doubt for a second that he will continue to bless those who read it and obey it. But God blessed the Septuagint too. And the Vulgate. And translations in dozens of different languages. God has blessed the NASB, and the NIV, and many others. God blesses those who seek his will and follow it. Those who find his will in the NIV are just as blessed as those who find it in the KJV. Limiting God’s blessing to a particular translation is historically untenable and spiritually dangerous. Well said! I’m thankful for the KJV, but I’m likewise thankful for the NASB, the NLT, the [H]CSB, the NIV, the ESV, the Geneva Bible, and so forth. I’m also thankful for the men and women who spent so much time and work to get good translations published. I’ve been blessed by reading the NLT, by studying the NASB, by consulting the Geneva Bible, and by memorizing parts of the NIV. I consider it a major blessing to have these helpful translations available! 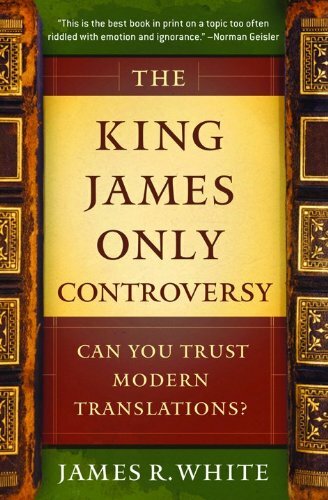 The above quote is found on page 302 of The King James Only Controversy by James White. Dated Language In The ESV? These words/phrases aren’t impossible for everyone to understand. But they do contain dated language, words and phrases that regular American English-speaking people rarely use. I have lived in four very different areas of the United States, and I have almost never heard people using these words or phrases in conversation or common writing. In fact, sometimes when reading Scripture in a group setting we’ve had to stop to explain the meaning of words and phrases like this in the ESV. In case you’re wondering, many of the words/phrases in the ESV that I’ve listed above are found in slightly older translations like the RSV (and to some extent the ASV). Also in case you’re wondering, impudence means rude or harsh, small in stature means short (in height or years), let it out means loan or lend, pretense means the act of pretending, pestilences means plague-like diseases, dissipation means careless living (possibly because of drunkenness), and recline at table simply means sit down to eat. I’m not saying we should throw out our ESVs. But I am saying that it’s helpful to use several translations when reading and studying the Word. Other translations I’ve come to appreciate include the NASB, the NIV, the HCSB, and the NET Bible. The NLT has also come in handy; we use it at home to read Scripture’s stories to our kids, and I’ve given it to a few Christians who don’t have a deep grasp of the English language. I have also use the NLT when preaching/teaching in a nursing home or jail setting where people aren’t familiar with Scripture and/or the English language. If you run into a tough word or phrase in the ESV (or whatever translation you use), go to a few different translations to help make sense of it. There is no perfect translation, but there are enough good ones out there to help us better study and know God’s Word, which is what we want to do as Christ’s disciples. Along with quite a few other translations of the Bible, I’ve been using the New Living Translation for a while now (the updated edition). Though it is not my favorite translation, and though I’ve seen some weaknesses in the translation, there are certain aspects of it I appreciate. For example, I like the modern language – this is a good translation to use for those not accustomed to detailed grammatical phrases, older language, and unfamiliar vocabulary. Sometimes I use the NLT in a prison setting or when I preach at a funeral (or other event) where the people are not very familiar with biblical language. I like the NLT for OT and Gospel narratives (specifically as I’m working through Joshua). However, I’m not as excited about the NLT in some of the Pauline epistles, because smoothing things out too much can take away from the tighter epistle constructions and thoughts. In case you’re interested, here are some scholars and teachers that worked on the NLT Bible translation team. OT: Daniel Block, Gordon Wenham, R.K. Harrison, V. Phillips Long, Bill T. Arnold, Ray B. Dillard, Al Wolters, Mark Futato, Doug Green, Richard Pratt, Willem VanGemeren, Joyce Baldwin, and Douglas Gropp (just to name a few). NT: Craig Blomberg, Don Hagner, Darrell Bock, D. A. Carson, Douglas Moo, Tom Schreiner, Moises Silva, Klyne Snodgrass, Greg Beale, Robert Mounce, and F.F. Bruce (just to name a few). To be honest, I’m not really “married” to a specific translation. I try to do most of my work out of the original, though I do tend to gravitate around the NIV and ESV. I sometimes use the NKJ as well, but I’m not a Majority Text guy. Furthermore, the archaic English grammar and stiff translation method of the NKJ can be pretty frustrating – try reading a long OT narrative from the NKJ out loud to people who never speak or read this type of old English. You get a few puzzled looks as you’re stumbling through the odd grammatical phrases. For example, take Joshua 8.4: it will come about, when they come out against us as at the first, that we shall flee before them. Who speaks like that? (By the way “at the first” simply means “like they did before.”) As a side note, I’m not one who thinks that archaic grammar is more reverent than everyday grammar. When people ask about translations, I say two things 1) don’t make your favorite translation a litmus test of orthodoxy and 2) use a few different translations in your reading – some “word for word” (NASB, NKJ) and some “thought for thought” (NIV, NLT) and some in between (ESV, RSV). Remember that every translation makes thousands of interpretive moves as they translate the original to English. Looking back at the last 10 years of my Christian walk, I noticed that my Bible reading time has increased when I purchase a new translation, because I want to see how they translated my favorite passages. This leads me to read more of it and it becomes an enjoyable reading experience for me. All in all, while I don’t think the NLT will ever be my primary translation, I do think it is valuable to have on my shelf. It is an OK translation to consult when doing textual work, biblical studies, and as I said above, reading the Word to people who are unfamiliar with the scriptures. If you’re not familiar with it and have been wanting to check out a different translation, you may want to check out the NLT.